A shelter is one of the central pieces in every backpacker’s equipment. 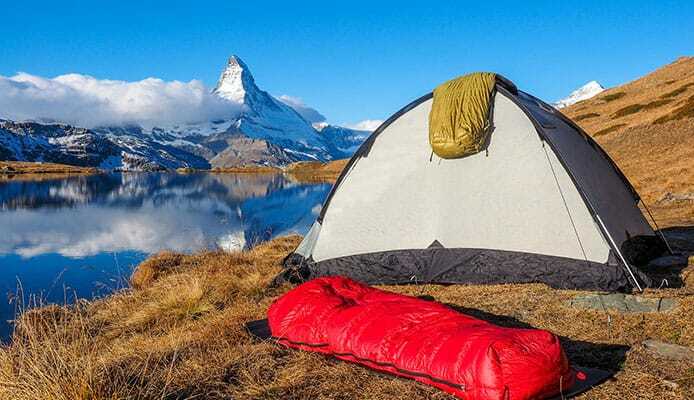 Most often we’re talking about tents – they come in a variety of styles and sizes so that most people can find a suitable one for their adventures. Most, but not everyone. Sometimes we feel that a tent needs too much space and that it would be nice if we could bring something more compact and light, to serve the same protective purpose while being much easier to carry around. This is where bivy sacks kick in. They are a minimalist solution to this problem, allowing you to cut weight and save additional space in your backpack. You get a proper overnight shelter which can be used in emergency situations too. They’ve come a long way since they first appeared, and they are now much more reliable and comfortable for you as the user. Our goal is to help you find the best ultralight bivy sack, so we’ve compiled a list of fantastic bivies, all of which offer different features you may find useful once you’re out in the wild. In addition, be sure to go through the buying guide below, since it will give you some pointers on what exactly to look for when you decide to buy one. The Ionosphere is our top rated ultralight bivy sack for a very good reason. It gives you all you would expect from a bivy, and comes with a smart design. When packed, it’s very small and compact, but when you set it up it’s fairly spacious (for a single-person shelter). This bivy bag has a low profile, which in combination with solid build quality gives get excellent protection in rough conditions – no matter if it’s heavy rain or strong wind. It’s somewhat specific for this bivy that it needs to be assembled (using poles and stakes), because it’s not freestanding. Luckily, it doesn’t take long to do this, and you get an exceptionally stable shelter afterwards. The package includes 16 tent stakes for securing it to the ground. You also get SnugPack’s patented anodized poles with press fit connectors, which create a spacious canopy over your body. It has two layers which give you protection and breathability at the same time. The outer layer (rainfly) is made of ripstop polyester, and coated with PU (polyurethane) to give it a 5000mm waterproof rating. On the other hand, the groundsheet is made of nylon, while the inner layer mesh is made of 50D polyester. This gives you good air circulation when it’s hot outside because you can open up the tent a bit, while retaining protection from insects. As for size, it’s a bit larger than other bivy sacks. When you fully set it up, you get a length of 94 inches, with a width of 39 and 28 inches in shoulder and foot area respectively. This gives even tall people enough room to sleep in, without feeling cramped. When you pack it up, it measures 17x5.25 and easily fits in your backpack. While it’s not the lightest, at 2.6lbs it’s still very light to carry around. This waterproof bivy sack comes with a repair kit too, which is a big plus. You can perform a quick fix on the go, if something unexpected happens. However, the tent has excellent durability so we hope it won’t come to that. The manufacturer gives you a choice of two colors when buying, brown and green. Considering the value you get for your money and the balance between size and weight this is probably the best bivy sack you can get. This is a lightweight bivy which prides itself on great portability. It’s also sure to give you a comfortable rest, so it’s an excellent choice for those always on the move. It’s constructed as a standard bag, but with a very useful addition. The Helium bivy features Delrin single-pole system, so you get a shock corded pole in the package. This pole is used to pitch the upper part of the sack and keep the material away from your head. It greatly reduces the claustrophobic feeling bivies create, and also increases comfort. The sack is very lightweight but at the same time durable and waterproof. All seams are taped, and you get a hydroseal floor which guarantees that no water will come in from under you. The product also has a mesh panel which allows you to open it up without worrying about bugs. Outdoor Research makes this product from 100% nylon. However, not the same nylon is used all the way around. The top is made of 30D ripstop nylon for nice water and wind protection, and also good durability. The floor, on the other hand, is made of tougher 70D nylon, with additional TPU (thermoplastic polyurethane) lamination. As we mentioned, it’s very light – the whole package weighs only 18 ounces. The package size goes well to accompany the weight. With 15x4-inch dimensions, it will certainly find it’s place in your bag even if you don’t have much space to spare. When opened, it has a length of 84 inches, and shoulder width of 26 inches. While it’s not the largest option, it fits an average adult quite nicely. The inside of this sack has straps for your sleeping pad, making the setup easier. You will also find a mesh pocket inside, which can be useful to store anything you need close at hand, like a flashlight or a multi-tool. The outside features five stake loops and one guyline loop, which you can use to add stability if you need it. It’s marketed as a 3-season tent, but you should be smart and think about some extra protection in case of heavy rainfall. Even still, it’s probably the best ultralight bivy sack that you can take anywhere and be certain you have a reliable shelter. The bivy from Winterial is another great choice for you to take on your hiking and backpacking adventures. It’s very high quality, guaranteed to keep you dry. It’s certified for three seasons, so you can rely on it even when weather takes a turn for the worse. Like the first product we talked about, this one also has two layers. The inside is made of breathable mesh, while the outer layer is removable and serves as weather protection, giving it versatility. In addition to this reinforced rainfly, all seams are sealed making sure your sack won’t have unexpected leaks. All parts are made of nylon, with rainfly having 3000mm rating, and the floor a 5000mm HH rating. The assembly is very simple – you roll it out, stake it to the ground, and attach the two aluminum poles (hoops) which hold the sack in position. The door is zippered, and also very large – giving you easy access. When it comes to size, this one leans a bit more towards comfort. When you open it up, you get a spacious bivy, measuring 90x38x28 inches. The size even allows you to put some of your gear inside. However, this does take a toll in weight, because it weighs 3lbs 3oz. When wrapped up, it will consume 18x4.5x4 inches in your backpack. Like we mentioned, you need to stake this bivy to the ground. Luckily, the manufacturer includes 14 stakes in the package, as well as 3 bundles of rope so you can secure your shelter properly. You can choose between three colors – green, lime and orange. If you get this one you can be sure you won’t get wet overnight. You can make it even better if you decide to combine it with a camping tarp. Here we have one more product from SnugPack, but with a slightly different design. 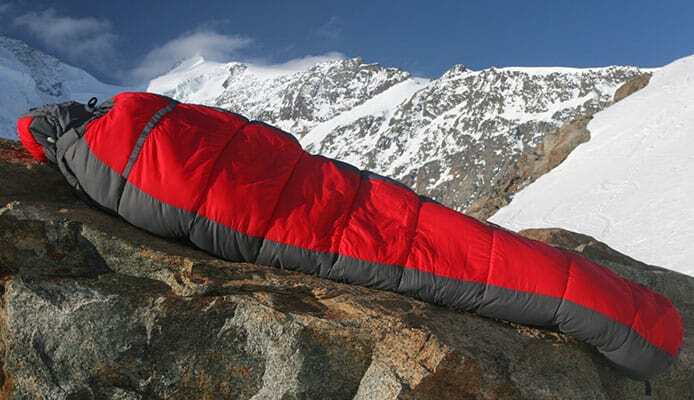 This is a highly compact bivy sack which can endure very harsh weather. It’s an excellent choice for hiking and survival in unforgiving circumstances. In addition to the protection you get, the choice of material and design give it very good breathability too. When you pick a spot where you want to put it, it takes about a minute to set it up. This is a product which can work on it’s own (freestanding), but you will get much more out of it if you stake it down. The stakes come in the package. As for design, it comes with lightweight aluminum poles (8.5mm in diameter), that create a canopy and give you greater comfort. These poles are very stable, and you attach them using screw-lock tips. You will find a full length zipper on the side, for a much easier entry compared to most bivy sacks. There is also a nice mosquito net if you feel warm with the full setup, but still need insect protection. Excellent materials were used to give it the strength and durability it has. The outer fabric which serves as a fly is made of 50D ripstop nylon, and gives you 5000mm waterproof rating to go along with the excellent breathability of the material. Nylon was also used for the floor, but with a PU coating and a total of 8000mm hydrostatic head rating. Of course, all seams are taped for full protection. While the pack is somewhat heavier than usual (39oz) the size is very appealing, measuring only 12x5 inches. When opened, you will get sufficient space inside for a good night’s rest. The length is 91”, while the shoulder width is 31” with the sack becoming slightly narrower in the head and foot area. You will find a small mesh pocket on the roof inside, which is handy. It’s a very good and versatile shelter for a decent amount of money. 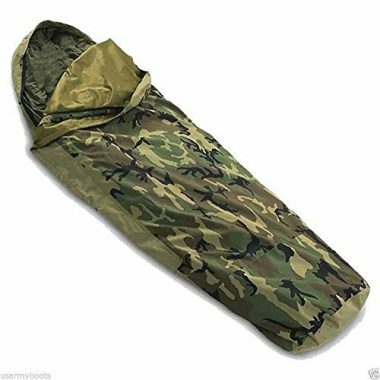 This is a bivy which is used by the US military, and made in the USA. What separates it from others we featured is that it comes with a Gore-Tex membrane. It prevents water from coming in but allows the vapor to go out, eliminating the condensation. 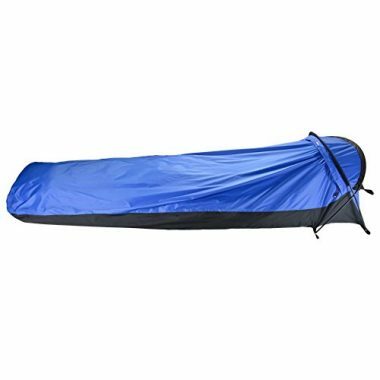 This bivy bag is a part of the 4-piece MSS (modular sleep system). The design is very practical too. It features a side zipper with a storm flap, which gives you quick entry and exit. In addition, you can fit most standard sleeping bags inside if you need to add warmth, making it great for winter camping too. However, it doesn’t have a mesh panel so you won’t get proper insect protection. It’s a bit shorter than some other products, with a length of 84 inches. This is still enough for decent comfort, especially given the shoulder width of 35 inches. The military bivy is a very durable product, which is easy to maintain too. You can wash it in your machine without worries. We mentioned earlier that it doesn’t come with a mesh. However, it’s very easy to modify so you can add a mesh yourself or make some other changes to make it more useful. Finally, the price is quite nice and the camo print looks good. The Alpine Bivy is a versatile 4-season product. Thanks to the Gore-Tex membrane as well as the design, you can use it year round. It’s fully waterproof but at the same time breathable which greatly increases your comfort. The mentioned Gore-Tex is responsible for such high performance. It’s a membrane which completely prevents water from coming in on one side, while the other side has many small pores that allow water vapor to leave the sack. This way you avoid condensation inside the bivy, and remain dry. The remainder of the sack is made of nylon. It’s rated 30D with ripstop feature, so you get complete protection. As for construction, it has a dual-pole system which holds the bivy and creates a nice space above your body. This allows you to put thicker sleeping pads and sleeping bags inside. The bivy has a hydroseal floor to keep the ground moisture from penetrating inside. As a plus, the floor has an anti-fungal coating which is very useful in preventing mold. It’s certainly one of the larger bivies out there, with 84 inches in length and 26 inches in shoulder width. The whole package weighs 32 ounces – this includes the sack and also the two poles we mentioned. When packed, it takes up 15.5x4 inches of space in your backpack. You will get some smart design solutions on this one. It has sleeping pad straps inside, as well as a nice mesh pocket for your belongings. The tent opening features a removable mesh screen, which can be very useful when it’s warm outside but you need insect protection. There is also an additional zippered vent which boosts air circulation. 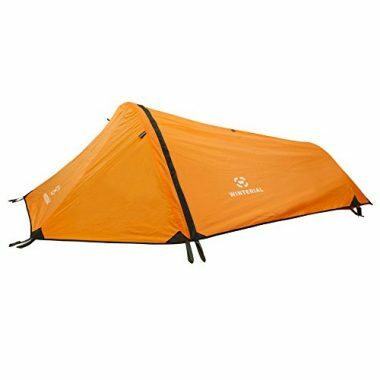 The outside of this bivy features five stake loops as well as a guyline loop. There will come a time you need these, since they can greatly increase stability in windy conditions. It’s really a bivy sack with excellent performance in any season. Even though it costs a bit more, it’s definitely worth it – especially considering the quality and durability you’re getting. When it comes to lightweight protection for summer nights, this is something that first comes to mind. 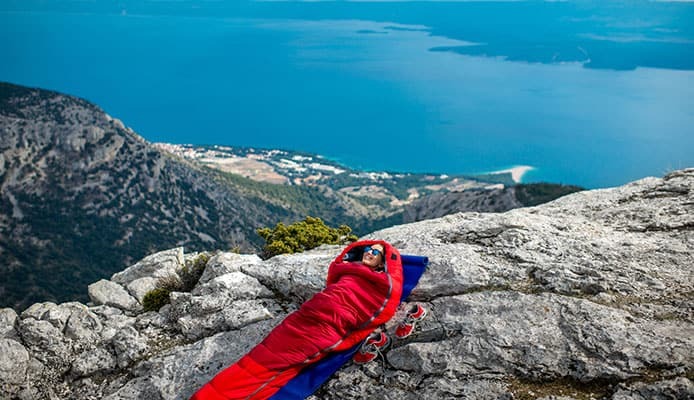 The Bug Bivy was designed to give you protection from all the flying and crawling insects around you, while allowing you to enjoy the breeze and the view of the night sky. 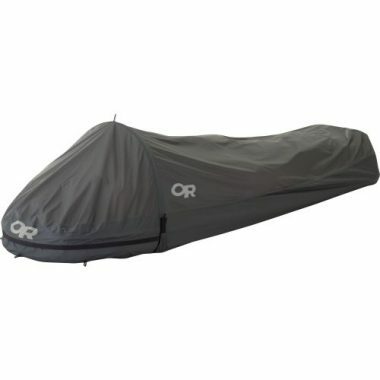 Keep in mind that this bivy won’t offer you any rain protection, it was not designed for that. This being said, the floor is waterproof so you don’t have to worry you’ll get wet if the ground is moist. The mesh is made of polyester, which has shown solid durability over time. The mentioned floor is made of nylon, with taped seams. Like the previous product from Outdoor Research, this one also comes with Delrin pole which lifts the net and keeps it away from your body. As for size, it’s very compact. When packed, it measures just 14x4 inches. Also, it’s the lightest product in our bivy sack reviews, weighing only 16 ounces. It still gives you enough space when you crawl inside, being 89 inches long and with a width of 25 inches at your shoulders. This sack comes with a mesh pocket and straps to secure your sleeping pad. On the outside you will find three stake and two guyline loops for additional stability. Compared to other sacks, it’s very budget friendly – you should definitely consider it if you’re planning on hiking in warm and nice weather. 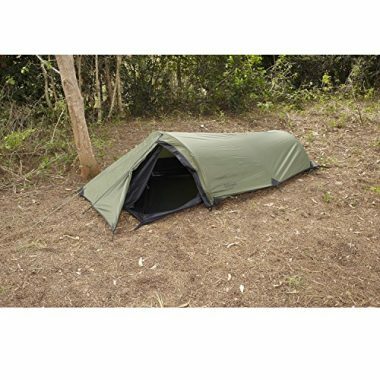 This is a bivy system which gives you great quality for a very affordable price. Like most others, it doesn’t require any complicated setup, so you need less than two minutes until you can use it. The design includes two lightweight aluminum poles which lift the material from your body. Thanks to this, everything is nicely contoured in the head and foot area, and the movement range inside is increased. A big plus is the facial ventilation system in the head area, which constitutes of two pieces of mesh. One mesh panel can also double as a window when you want to have a view, or you can zipper it completely when the rain is heavy. The body is made of ripstop nylon, with a 5000mm hydrostatic head rating. At 2lbs weight, it’s one of the lighter sacks around, especially considering that poles come with it. Thanks to the mentioned poles, the height inside is 17 inches which most users really appreciate. It is 91 inches long, with a width of 32 inches in the shoulder area. All of this attributes to a very spacious sack. You can get it in blue color only, but it looks pretty sleek. If you pick this one, you can be sure it will last for many trips to come. Even though a bivy sack is a pretty specific product, there still are some differences in terms of size, weight, comfort and materials used among other things. You should be aware that bivies are smaller than tents, and give you a limited space inside. In turn, you receive much greater portability and practicality. Take a look. While reducing size and weight is something manufacturers focus on when designing bivies, it still needs to have enough room for you when it’s time to sleep. When talking about dimensions, there are two things you should think about – how large is the sack when you open it, and how small is it when packed. As you had the opportunity to see, most bivies range between 80 and 90 inches in length, with some being even longer. If you are a tall person, you should definitely go for a longer bivy – otherwise you might not be able to zip it up properly. Width also varies from one product to another, and it’s different in shoulder and foot area. Length, width and also height greatly influence the comfort you’ll be feeling inside. Some people feel a bit claustrophobic when they start using a bivy bag, so it may take some getting used to. You should also be aware that most products won’t allow you to fit your gear inside, so you may consider getting a waterproof backpack. Some products come with poles and some don’t. Poles are attached like hoops which pitch the material and form a canopy over you. This gives you significantly more head space, and reduces the feeling of unrest we mentioned because the fabric doesn’t sit on your face when you zip the bag. When packed, it should take as little space as possible. All products we listed are very small when compressed, but there are still differences between them. If your bivy sack comes with poles, stakes, or heavier materials for example, you can count on it being bulkier. It all depends on what you need and what your willing to sacrifice in order to get the smallest package possible. In addition to compact package, you also shouldn’t feel the weight of the bag when on a long hike. Weight usually ranges from as little as 1 pound to just a bit over 3 pounds. This is somewhat the top limit it’s allowed to have – if it exceeds it by much you might as well consider getting a backpacking tent. Like size, weight also depends on the accessories which come with the sack. If you decide to cut down on weight, make sure you don’t eliminate anything you may really need when outside. As with most gear designed to give you shelter and weather protection, materials most often used are nylon and polyester. Their popularity really makes sense – they are lightweight, aren’t overly expensive and give you good weather protection. Manufacturers apply different coatings on top of these materials to boost their performance. This is usually either PU (polyurethane) or TPU (thermoplastic polyurethane). Basically very similar, these coatings greatly improve the waterproof rating of your bivy, which we’ll talk about a bit later. You will sometimes find “ripstop” in the description for both nylon and polyester. A fabric with this design prevents large rips if the fabric gets damaged, which is a big plus. In addition to these, some special materials like Gore-Tex are also used on some products. This is a membrane which completely blocks water from coming in, while millions of pores allow the vapor to leave the sacks preventing condensation. There are many materials similar to Gore-Tex out there, which all have their ups and downs. You should weigh your decision carefully when choosing, so you get proper rain and wind protection. Bivy sacks can help keep you warm by retaining your body heat inside. The efficiency in this department varies from product to product of course, mostly depending on the type of material used. You should check what the other users had to say about this to get a clearer picture of what you can expect, especially if you plan to use it in the snow. Also, consider combining it with a winter sleeping bag or at least bring a blanket for additional warmth. Even though this is not the main focus point of bivy sacks, you still need to get a good rest when you use them. Several factors contribute to this, and bivies are becoming better and better. As we mentioned earlier, check that your new product has sufficient length and width for your body frame. It greatly helps if you have some space above your body too. The design can make your user experience better – whether you can set it up quickly, and if you can easily get in and out of the sack. Finally, waterproofing and breathability are key components of your comfort inside, because it’s not very fun to wake up wet. As we mentioned earlier, the waterproof rating depends on the material choice and additional coating. It’s presented as Hydrostatic Head (HH) rating, where a larger value means better protection. Basically, this is tested with a water column pressed against a material and filled with water to a certain level (measured in millimeters). Then its checked whether the material leaked or not over a certain time period. At least a 1000mm is required for a material to be called waterproof, and all of our product greatly exceed this. The rating is usually not the same for the fly and the floor of your bivy. Floors will come with a larger rating, because the ground can be very wet and the floor is exposed to it for a longer period of time. In addition, it really helps if the bivy sack you’re getting has taped or welded seams. This eliminates the possibility of water coming through the needle holes. This is often pointed out as one of the weak points of bivy sacks. Waterproof materials aren’t very breathable, and this becomes even more obvious with bivies. The air can’t circulate, and you might encounter a condensation problem. Droplets of water form on the inner side of your bivy because the vapor has nowhere to go. For this reason, try to look for products which have mesh panels or special vents which improve the circulation and eliminate this problem. If you choose to get a bivy made of Gore-Tex or something similar, it will greatly increase your comfort in this area. Most bivy sacks are waterproof, but you won’t be able to use each of them in every circumstance. Some are designed for warm weather and insect protection, while you can also get a 3 or 4 season bivy tent if you plan year round adventures. You need to think about how long you’ll be staying out and the general weather conditions you’re expecting. Bivies are the best choice for an overnight stay or even a couple of nights, but if you plan a prolonged stay you should consider a larger and more comfortable solution, like a 4-season tent for example. Also, some product will be more comfortable in warmer months, while others will keep you nice and cozy in cold weather but make you sweat when it’s warm. Weigh the options and make a choice which suits your hiking and backpacking style. Perhaps the best extra feature your bivy can have is a mesh panel (or a complete mesh inner layer). This gives you bug protection when you want to unzip or remove the rainfly, while enabling free air circulation. You should look for a sack with this feature, because nobody enjoys mosquitos buzzing and bugs crawling over you. In addition, some products have extra vents which function even when the fly is completely zipped. Some manufacturers include stakes and guylines, which you can use to properly stabilize your shelter. Finally, some things are added to improve your comfort, like small mesh pockets inside or straps to keep your sleeping pad in place. Q: What Is A Bivy Sack? A: A bivy sack is a shelter for one person which you sleep in, and serves as a more compact and lightweight alternative to a tent. You can easily take it anywhere, and you’ll always have something to keep you dry and warm at night. Q: Why Should I Choose A Bivy Sack Instead Of A Tent? A: This is a great choice if you need something to sleep in, but you want to save space and cut weight when packing. It’s much lighter and smaller than any tent out there. It’s also a good emergency shelter you can set up quickly, faster than most tents. However, keep in mind that because of the size it isn’t very useful for hanging out inside like you would do in a tent. Q: How Do I Prevent Condensation In My Bivy Sack? A: As we mentioned when we discussed breathability, you can have less condensation inside if you choose a sack with good design and material choice. Make sure your new bivy has mesh panels, and unless there is heavy rain you should leave the zipper open so the vapor can escape instead of making condensation inside. Like we said, dedicated vents can help reduce the condensation too. Of course, you can always unzip the sack a bit and ventilate it manually. Q: How Do I Wash My Bivy Sack? A: There will come a time when you need to clean your sack before next use. Luckily, most bivy sacks can be washed in a machine, but you should always check the label or instructions. Whether you choose to wash it in a machine or by hand, always rinse it off properly. Some can go in a tumble dryer, while others should be left to air dry. In any case, make sure it’s completely dry before packing it, otherwise you may risk mold or weird smells. Bivy sacks are an excellent solution if you need a minimalist shelter instead of taking a large tent with you. A bivy can also serve as a backup in your gear, because one never knows. It certainly has it’s advantages and disadvantages, but it’s a fantastic addition to your equipment if you know what to expect. Make sure you go through all the features – only this way will you be able to find the best bivy sack. We hope that our guide made your choice easier. Have fun hiking! Have you tried a bivy sack that made it onto our list? Did it give you satisfactory weather protection? Was it comfortable to use and sleep in? Please share your experience with us in the comment section below.